of all your kitchen knives, your paring knife and your chef knife are the most important. One of my favorites is a high-end rice cooker. That will forever be my first recommendation. In my book, a top-notch rice cooker will save you more time than anything else, and possibly it is the difference between success or failure, for cooking whole grains definitely takes time. I use mine every day. My next favorite implement is a Börner V-Slicer, which is a mandolin. I wrote about it some time ago, and it is my next favorite time saver. There are the Nutribullet, the NutriBulletPro and the MagicBullet, which I consider also to be major time savers and they have a small footprint that is great for apartment living, as well as an old-fashioned mortar and pestle. Then there is the immersion blender, which I have referred to, but I have not (yet) devoted a full blog post to it. Many plant-based cooks swear by an Instant Pot. The difference can be summed up as follows: if your knife is sharp, cutting up an onion won’t make you cry. If your knife is sharp, you will easily slice a ripe tomato – ripe, but firm, but not overripe and soupy. Those are the simple, unavoidable daily tests. Here is an excellent source for some serious advice for vegetable carving. In practice, many useless kitchen gadgets, such as a garlic press, owe their existence to the fact that people don’t keep their knives sharp, or simply they don’t have the knife skills. an 8″ chef knife. In my experience the 10″ chef knife is not much use, for us vegans don’t carve a lot of turkeys. a bread knife is a basic need in some people’s eyes, but I find I hardly ever use mine, for in the #WFPB lifestyle we tend to prefer eating whole grains over eating bread. after the basics, I personally best like a Japanese kitchen knife for vegetable cutting, a nakiri. The more I use it, the better I like it. I’ll write about nakiri knives and other vegetable knives some other time. a santoku knife is nice to have, but I would not miss it if I did not have it. a slicer, such as a yanagiba, has not much use in the plant-based kitchen. 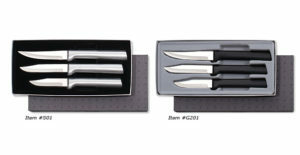 The upshot is, knife blocks are a waste of money – you will have too many knives you do not use. I prefer a magnetic strip on the wall, so that my knives stay sharp and are always at my finger tips. By the way, one of the side benefits of running a #WFPB kitchen is it stays much cleaner if you’re not cooking with oil! Plus, I am sure that the Dept. of environmental protection will appreciate it as cooking oil in the sewers is one of their biggest headaches. The paring knife is for everything off the board, i.e. in your hand. The site I cited above, www.knifeplanet.com, has some great advice. I would agree with their choice of paring knives as at least reasonable, though my personal favorite is probably the MAC knife Professional at the high end, along with their excellent bird’s beak paring knife, and the Rada Cutlery paring knives at the low end. Rada also produces a very serviceable curved paring knife, which they call “granny” paring knife. Take your pick, but for a budget choice Rada Cutlery is superb. While you are at it, get their sharpener too. The knives will set you back about $15-$20 and the sharpener about $7.50 each. So assume you spend $25-$30 on the paring knives. In my view, paring knives should have slender handles for convenience, for paring knife uses are primarily close-in work in your hand. That means the length range is from 2.5″ to 3.5,” and definitely not with a handle like a chef knife, as some designers try to do. To me, above 3.5″ is the borderland of paring knife vs. utility knife and 4″ – 5.5″ is the range of the utility knife, sometimes also known as petty knife or prep knife. With a 2.5″ paring knife, I can conveniently operate with my thumb opposing the tip of the knife, which is a must for finicky work like coring blemishes out of strawberries. The Chef Knife is for is for everything on the board. It’s the only other knife you REALLY need and for all practical purposes, you really only need an 8″ chef knife. With a little bit of looking around you will find plenty of choices even in the budget category of $20-$40. Ryky Tran (Burrfection on YouTube), considers the Mercer Culinary Renaissance ($45) the winner in this category for 2017 and he also likes the Mercer Millennia 8″ (x30cr13 steel, HRC 56, at $30). Others say the Victorinox Fibrox ($45) HRC 55-56. 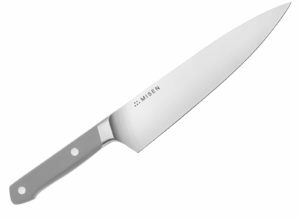 Personally, my favorite is slightly more expensive, but a real good value, it’s the Misen Chef Knife for $65, made from AICHI AUS-8 steel, with HRC 58-59. It is superb for sharpness and edge retention, with a 15 degree dual edge and a very slender spine, which is great. Another personal favorite is the MAC Original 7.5″ Chef Knife. It has a very thin spine that is great for working with veggies and fruit and it has excellent edge retention. Upkeep requires some careful attention for it has a 70/30 bevel. Meanwhile, I have found some other interesting entries in the budget category. Culinary Obsession offers a nice knife that is made of German 4116 Stainless Steel, for about $30. Notice it has a half bolster, which makes sharpening easier. It is a decent knife, but for prolonged use it pays to get something more comfortable. Imarku offers a very nice 8″ Chef Knife made of high carbon stainless steel, 7CR17MOV stainless steel contains 0.7% carbon, at $29.99 with a hardness of 58-60 on HRC (Rockwell Hardness Scale), let’s call it 59. This is another decent knife with a half-bolster. Imarku offers an interesting single bevel chef knife made of German 4116 Steel, and because it is single bevel, it is extremely sharp. About 57 HRC, listed as 56-58. This is another knife with a half-bolster. If you have not worked with single bevel knives, this is an economical way to learn. Then, there is the Kuma knife, which is quite solid, at about $25, it is made of 3Cr13 Steel. According to KUMA it is rated at 52 +/- 2 HRC, but it still has amazing edge retention. The same company also offers a decent honing rod for about $15. Don’t get too course of a honing rod, you want a medium to fine. This one is quite good as a medium rod in my experience. The Kuma knife showed surprising edge retention in a video by Burrfection and my own experience confirms that. However, this is a full-bolster knife, and you’ll have to file down the bolster over time, which is easy to do with e.g. a dremel tool, or even a steel file. Ergonomically, it has the Culinary Obsession and Imarku knives beat, however. It is definitely more comfortable to hold and use for prolonged periods. Lastly, there is also the Cozilife chef knife, which used to be about $25, but seems to be sold out currently. The steel of this knife is a German made X50CrMoV15 steel, with 57 HRC +/- 1 degree. It has a thick spine. Either the Kuma or the Cozilife is a knife I might choose for chopping the tops off those casava roots. As a general observation, the Culinary Obsession and Imarku knives seem to pretty much come from the same mold, probably a contract manufacturer. There are other knives on the market that all seem to stem from that same mold, including seemingly Zelite, Kacebela, Kutt and others that look like they all share the same DNA, with the quality of the steel and the details of the handle seemingly the main variations, but the shape of the knife and the build suggest the all come from the same factory. Finally, notice that for the harder steels, you will want a ceramic honing rod, like these from MAC, a 2000# rod, or a 1000# rod. Most of the knives mentioned here are in the 55-60 range and can benefit from a honing steel, but these ceramic rods can handle knives of any hardness. To me two 8″ chef knives are better than one, and probably the KUMA and the Misen are my two favorites. If I needed to chop the tops off a cassava root, I’d use the KUMA or a Chinese vegetable cleaver, not the Misen, for that is rated at 58/59 HRC and therefore more prone to chipping with such hard, woody material. If you have a kitchen where kids operate or you cannot protect your knives, I would not suggest to get knives with more than 60 HRC. They are too prone to damage from careless handling. If you have the luxury of total control and feel like indulging please feel free to explore such high-end knives. The 52-59 range is good for “work horse” knives. Culinary Obsession offers a pretty decent 1000/6000 grit whetstone for about $33 or so. That grit level is about all you need for regular sharpening. Only if your knife is damaged will you need to start below 1000 grit. I have just started using it, so I don’t have long experience, but this stone works very well. You might want to add a 6000# nagura stone for about $10, to get your stone started up and clean during sharpening. Here is a fun video by Ryky Tran on the trade off decisions between a budget knife (Kuma) with some high end whetstones (Chosera 800/3000) versus a high end knife (Wusthof) with a budget combo whetstone (800/3000). It’s just fun to watch. Meanwhile, if you can afford only one stone, I think the 1000/6000 is a better choice. Then, if you ever need to restore damaged knives, you can get a lower grit stone. Meanwhile, the overall conclusion from the video is obviously that if you can afford it, better quality stones are worth it. One of the best tutorials on sharpening is by Korin, the premier Japanese knife shop in NY. Here is the complete Korin Learn How to Sharpen tutorial, it is a very systematic approach. With the small collection that is suggested here, three paring knives, two 8″ chef knives, one softer and one harder, and some basic sharpening gear, you have a better kitchen than most, as long as you keep up with some basic maintenance. Again, the paring knife is for off the board and the chef knife is for cutting on the board. There is nothing else. For a plant-based kitchen, I think there are two more knives you may want to add at some time… a Japanese nakiri and eventually maybe an usuba knife and possibly a “petty knife, ” also called a prep knife, usually about 5.5″ to 6.” I will do a longer post about those some other time. My favorites list of kitchen knives companies would probably include Kuma, and Victorinox, MAC, Global, Shun, Dalstrong, ENSO/Yaxell and Kanegetsu Saiun. 4116 German Krupp Stainless steel is fine-grained, stainless steel made by Thyssen-Krupp in Germany is used for hygienic applications and food processing.The balance of carbon and chromium content give it a high degree of corrosion resistance and impressive physical characteristics of strength and edge holding. Retention in actual cutting tests exceed blades made of the 420 and 440 series of stainless steels. 7Cr17MoV Steel is A Chinese Stainless steel that is similar in quality to AUS6 stainless steel. The following formula is a break down in the steel: 7CR part means it is 7% chromium and the 17MoV means .17% molybdenum and .17% Vanadium. AUS-6 steel is a entry level Japanese cutlery steel in the same class as 440A. AUS-6 was used a lot in entry level knives, but has been seen less and less in current knives. AUS-6 steel is one grade higher than AUS-4 and one grade lower then AUS-8. AUS-6 is typically hardened to RC 55-58 or so, and take a very fine edge, though edge retention is not as good as steel such as 440C. AUS-6 is part of the family of steels that consists of AUS-4, AUS-6, AUS-8 and AUS-10. 3CR13 steel is a Chinese Stainless steel that is similar in quality to 420J2 (AUS 4) stainless steel. According to the site www.bssa.org.uk:X50CrMoV15 is a high hardness martensitic stainless steel. In strip form, its dominant use is for high quality knife blades. This is a rare, possibly a unique, example of the EN Name of a stainless steel grade being used for marketing purposes. Approximate Composition – 15% Cr, 0.7% Mo, 0.15% V, 0.50% C (EN composition range. No ASTM equivalent). X50CrMoV15 uses the moderately high carbon content of 0.50% to develop a high hardness martensitic microstructure. The higher chromium plus small molybdenum addition gives a greater corrosion resistance than standard martensitic grades. Vanadium allows higher tempering temperatures to be used and gives greater toughness. Again, of all the tools, sharp kitchen knives are number one, and the paring knife and the chef knife are your primary work horses. For about $100-$200 you could have your starter set, 3 paring knives for about $15-20, one or two 8″ chef knives in the range of $25 to $75 and sharpening supplies ($40 for a Rada sharpener plus the 1000/3000 Whetstone) and a steel for $15. 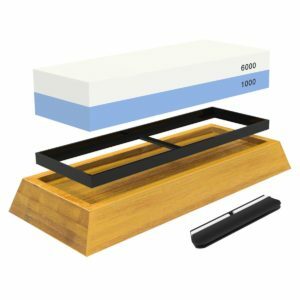 At some point, you will need some kind of a lapping plate to keep your whetstone flat and a nagura stone is a good idea, both to get the sharpening slurry started and to keep the stone clean during sharpening. But that’s it. The bottom line is the cheaper blades (lower on the HRC hardness scale) will not keep their edges as long as the real high end steels, but a little loving care and maintenance will do wonders. Harder steels, above 60 HRC are more brittle, so they require more care in handling, but at least theoretically less maintenance than the 52-59 range are the real every day work horses that are not easily damaged. In practice, if you start working with harder knives, you will probably increase your expectations of sharpness, and be stropping your knives regularly. Again, of all the tools, sharp kitchen knives are number one, and the paring knife and the chef knife are your primary work horses.